Normally I would review books in a series separately, but as they were all pretty quick reads and I read them back to back, it seems easier to review the series as a whole. 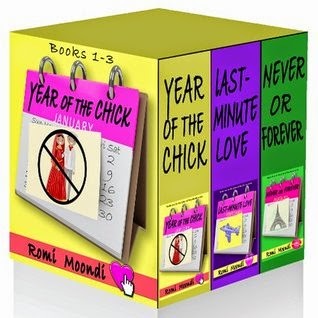 Year of the Chick (Book 1), Last Minute Love (Book 2) and Never or Forever (Book 3) are loosely based on the life of the Canadian-Indian author, Romi Moondi. If you love diverse chick lit, you’ll enjoy her writing. When we first meet Romi in Year of the Chick, she’s living in Toronto with a sister she can’t stand. On weekends, the two are forced to pack it up and return to their parents who live a bit of a distance from the big city. It’s only their jobs that allow them the freedom to live away from home, as Indian women are expected to stay with their families until they’re married. At work, at home, no matter where she is, Romi spends much of her time thinking about her lack of a love life. Her friends have no problems attracting men, some would rather not even be bothered, but Romi feels like the invisible woman in the room far too often. When clubbing, matchmaking and online dating fail to yield any results, Romi takes to blogging. If she’s not going to be a successful dater, the least she can do is write about her experiences so others can learn from her mistakes. Each book highlights Romi’s experiences with a different leading man. Overall, they’re enjoyable, but if I had to pick a least favorite, I’d go with book 3, Never or Forever. Book 1 really drew me in and book 2 held my attention well enough, but book 3 just seemed to meander along a long and twisty road leading nowhere that abruptly ended. The Romi we meet in book 3 is certainly not the one we originally met. I wouldn’t necessarily attribute that to growth though; it seemed that she lost a bit of her spark. As much as I anticipated what was coming after Year of the Chick and Last Minute Love, I can’t say that I’m all that interested in following up to see what happens after Never or Forever.